Beautifully clear water: Diving in the waters around Cozumel is a dream come true. You’ll literally be able to see why Cozumel is called the best diving in the Caribbean. The Mesoamerican Reef: The second largest barrier reef in the world, the Mesoamerican Reef offers tons of places to explore. Diverse wildlife: Whether you’re looking for whale sharks, parrot fish, giant lobsters, or even green iguanas, you’ll fall in love with the animals you’ll encounter. 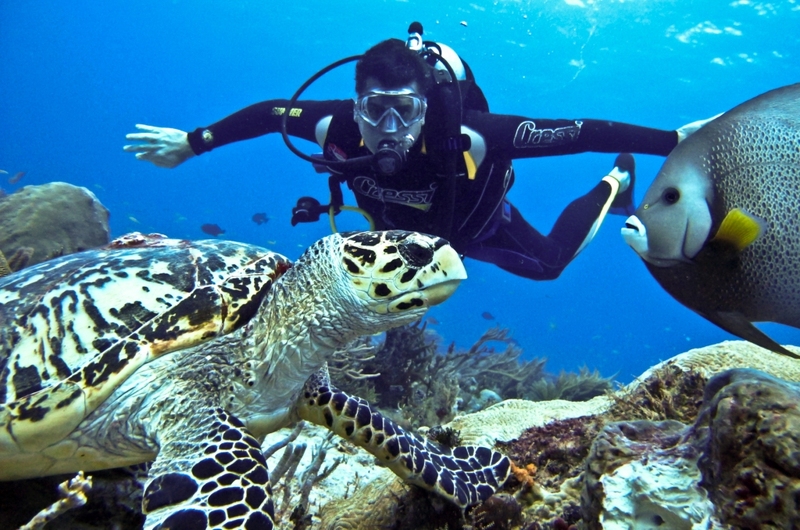 Variety of dives: Cozumel offers great opportunities for shore diving, boat diving, and wall diving. Amazing beaches: Cozumel’s shoreline offers both popular and secluded beaches for when you want to hang out or relax. Culture and history: There’s a long history of Mayan culture and Spanish colonization on Cozumel. Experienced dive instructors: Whether you’re a novice or a potential dive instructor yourself, you can find the training you need with a Blue Magic Cozumel Divemaster Internship. Educate yourself on sustainable and safe seafood choices. Use fewer plastic products especially small plastic items because those are the ones that are truly detrimental to the ecosystem. ALWAYS clean up after yourself at the beach. Do not leave trash behind. We can still experience the best scuba in the Caribbean with GoPro Blue Magic Cozumel! Keep the oceans clean and protected, or there will no longer be sea life to experience for future divemaster pros. What’s on a Diver’s Back? Buoyancy Compensators(BCs) hold your peripheral gear in place, takes the load of the oxygen tank off of your back, and most importantly lets you achieve neutral buoyancy at any depth. Regulators convert the tank air’s high-pressure into that of your surroundings allowing you to breathe it. It also delivers air to other places like your BC inflator. Your PADI instructors will tell you more about your scuba gear. If you are looking for an unforgettable underwater experience, come to Divemaster Internship for world class training!